The JJ 543 is an outstanding entry into the HIFI world. Designed as an integrated unit with four separate preamp inputs/channels, a sub out, regulated and un-regulated outputs, this is the full package. If you ever stumble into the Eurotubes shop, you'll undoubtedly find a JJ 543 ripping in the background. The amp is designed around a pair of 6L6GC's per channel utilizing an ultra-linear topology with custom Bifilar wound double c-core output transformers. The result is a muscular 35 watts per channel with excellent bandwidth and transient response. 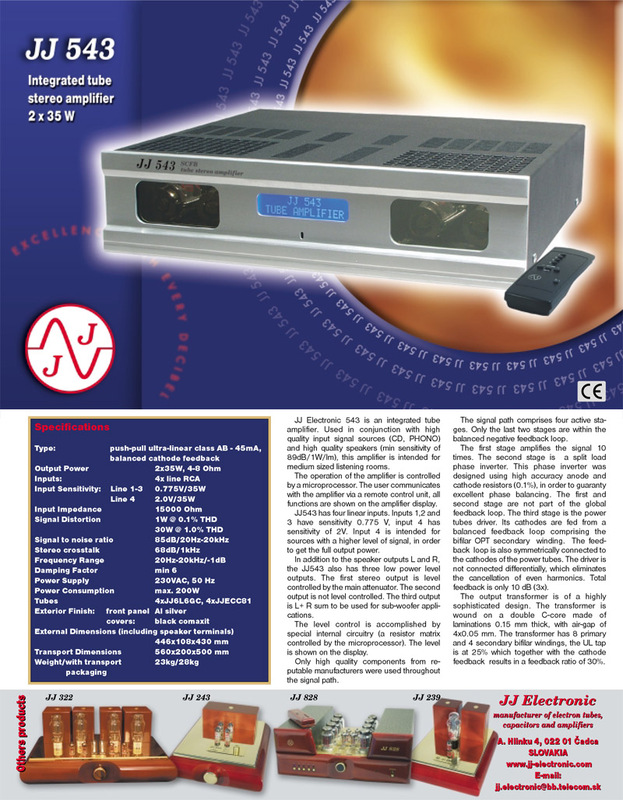 The JJ 543 is operated 100% with its matching remote control. Each channel volume can be pre-set and switched on the fly and there are sub woofer outputs. The amp utilizes a controlled warm-up feature to maximize tube life and reduce the risk of start-stop related failures. Channels 1-3 are identical and ideal for most sources. Channel 4 is padded to accept hotter source signals. Shipping: These amps weigh about 60 Lbs! We typically ship them by FedEx 3 day service however we will contact you so can choose how you would like it shipped. Topology: Ultra-Linear push/pull with four integrated/switchable pre amp inputs. Inputs: Four separate channels. Channel four is padded for high output sources. Input Sensitivity: 350mV for max output for Channels 1-3. 2V for channel 4. Output Transformer: Custom Double C-Core, Bifilar wound. General: This is our shop amp here at Eurotubes. The JJ 543 is without a doubt the most amp you can get for the money. JJ still applies the same attention to quality and utilizes a huge array of in-house built components. At 35 watts per channel there's plenty of power for medium-large rooms. The remote control interface makes operation a breeze and the sub out feature is great for bookshelf speaker owners looking to expand. This is one of our favorite amps for spinning vinyl when mated with the matching 283 phono pre amp. The Fourth channels padded input is ideal for high output MM Carts such as the new Ortofon 2M series. These amps are adjustable bias and extremely simple to dial in. All that's necessary is a multimeter and small plastic screwdriver. Inquire for details.